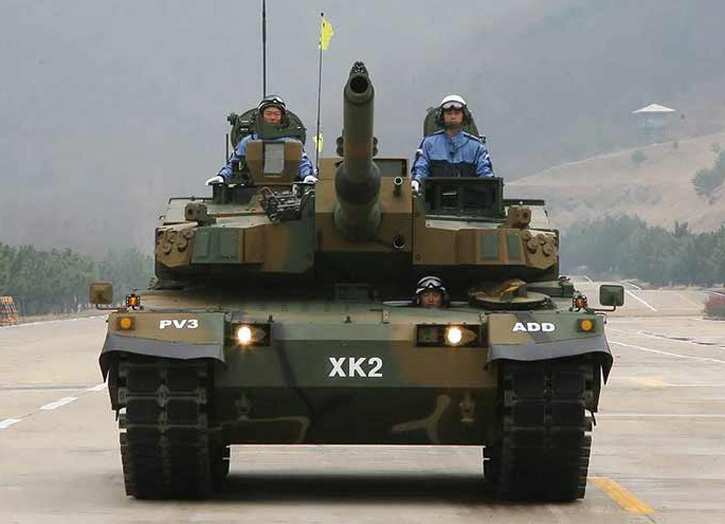 The Korean automotive industrial giant Hyundai Rotem Co. has signed a contract worth US$820.29 million (901.5 billion won) with the Korean Defense Acquisition and Procurement Agency (DAPA) to deliver the first 100 'Black Panther' K2 Main Battle Tanks (MBT) to the South Korean Army. 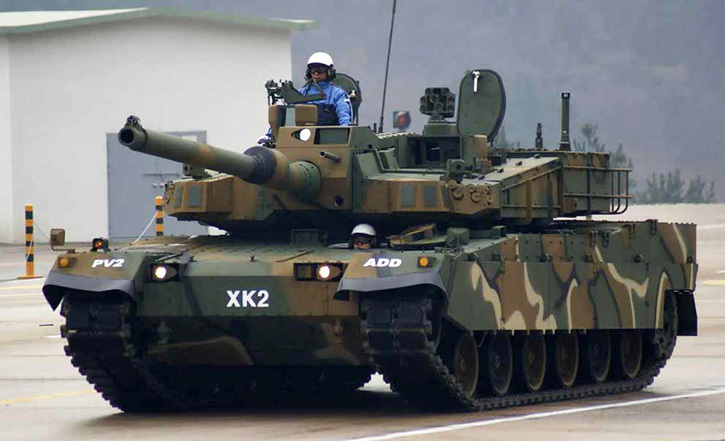 The Korean automotive industrial giant Hyundai Rotem Co. has signed a contract worth US$820.29 million (901.5 billion won) with the Korean Defense Acquisition and Procurement Agency (DAPA) to deliver K2 Main Battle Tanks (MBT) to the South Korean Army. The initial order is believed to be for 100 tanks, with follow-on requirement for additional 400. The first production of pre-production models of the tank, powered by German MTU engines were delivered to DAPA and the Army in June 2014 for evaluations. 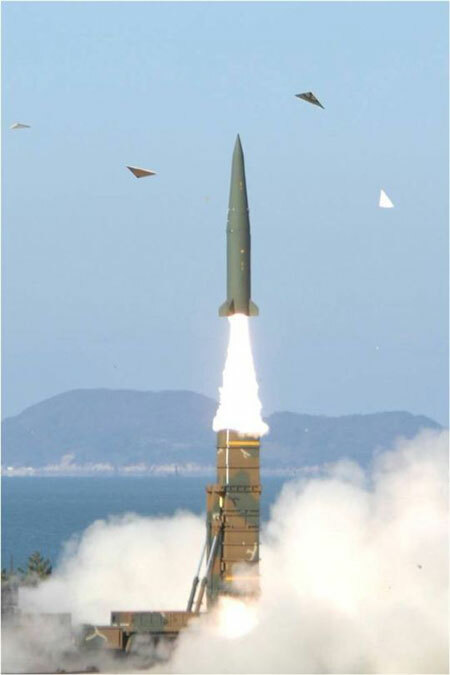 Serial production of full production version with a Korean made powerpack is expected to begin in the first half of 2015. 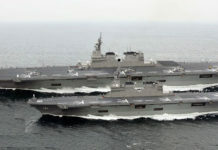 The K2 will replace the K1 tanks currently in service. 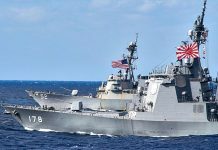 The contract was signed after the Committee on the Defense Acquisition Program cleared the acquisition. 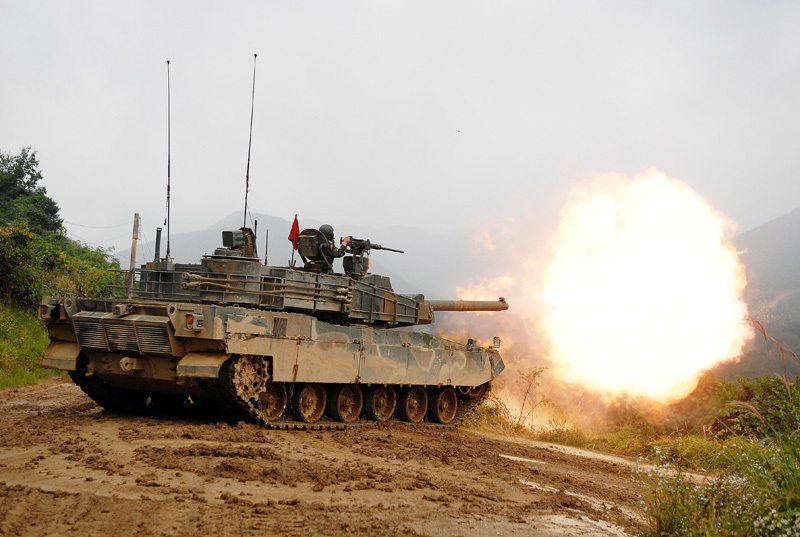 Under the contract Hyundai Rotem will deliver the new ‘Black Panther’ tanks by 2017. The original initial operational capability foreseen for the new tank was 2016. The K2 was selected by the Turkish Ministry of Defense as the basis for the indigenous Turkish MBT Altay. The company is planning to demonstrate the new tank at the upcoming IDEX 2015 exhibition in Dubai, as it considers countries in the Middle East and Africa to be potential export customers for the new tank. The initial order is believed to be for 100 tanks, with follow-on requirement for additional 400. 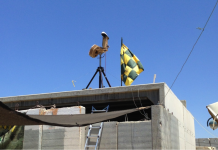 First pre-production models of the tank, were delivered to DAPA in June for evaluations. Serial production is expected to begin in the first half of 2015 with deliveries expected in 2017. The K2 is armed with a smoothbore 120mm gun, coupled with an autoloader supported by a 16 round magazine, enabling the crew to fire rounds in quick succession of 3 second intervals. the total ammunition capacity is 40 rounds; including APFSDS, HEAT MP-T and a smart munition designed to hit targets in top-attack (KSTAM). The development of a locally designed engine was one of the main reasons for the delayed introduction of the new tank, as the compact power pack did not produce enough power and moment to achieve the necessary acceleration. Despite some controversy, the Joint Chiefs of Staff lowered the bar for its acceleration performance, paving the way for its deployment, Yonhap said. In addition to the main engine the K2 has an integrated auxiliary power unit delivering 100w of electrical power when the main engine is shut down. The APU is driven by a small gas turbine. The new model is powered by a 1500-horsepower engine and transmission developed and produced by the Korean company Doosan Infracore Co. The transmission is made by S&T Dynamics. The Black Panther weighs 55 tons and is operated by a crew of three. It is armed with a locally produced variant of the L55 120 mm smoothbore gun manufactured by World Industries Ace Corporation. An autoloader supported by a 16 round magazine is used, enabling the crew to fire rounds in quick succession of 3 second intervals. the total ammunition capacity is 40 rounds; including APFSDS, HEAT MP-T and a smart munition designed to hit targets in top-attack (KSTAM). 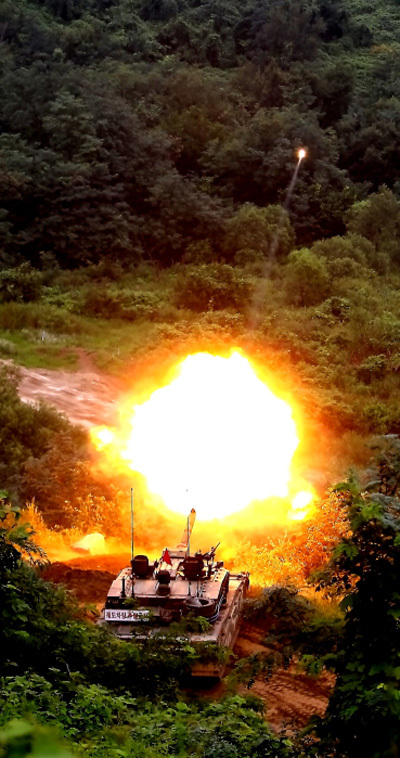 The tank is equipped with day camera, thermal and milimeter-wave sensors, support automatic target detection and tracking under all weather conditions. The tank is well protected with passive and reactive armor suite; additional protection could be added by the integration of a Korean developed Active protection System designed to defeat shaped-charge rounds from close-in distance (10-15 m’). 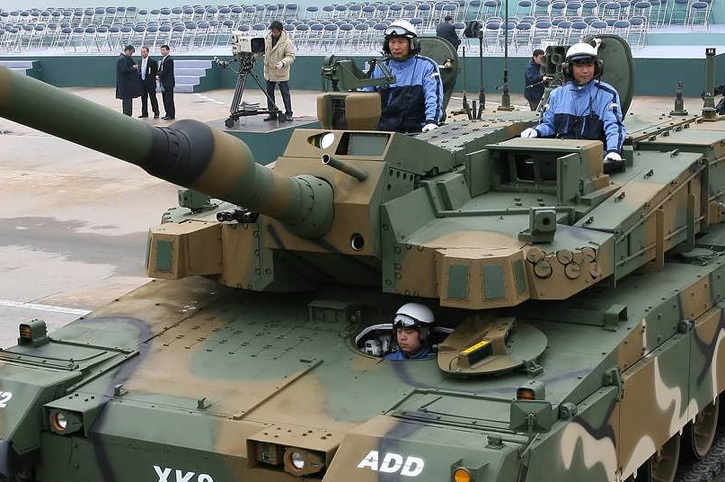 The tank is also provided with radar and laser detecting sensors, that could be coupled with soft-kill countermeasures.